We’re ready, Freddie! 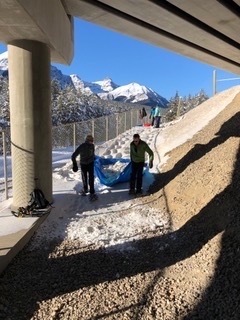 The entire 50k's have been track set today; thank’s to the Chateau, Parks, Baker Creek and the Banff loppet crew of criminals. A few cm’s of new snow last night, forecasted 0900h temp -12C at the start, finish temp -3C. As appropriate, the loppet trail is marked with orange flags. a) Because of road plowing in the lower parking lot, the Chateau crew have set our track off the lake to climb up above the upper parking lot, then descend down to the Tramline. It will be fast! Skiers will need to exercise caution on the descent. b) As usual, at the 1st/upper crossing on the Chateau road, vehicles have the right-of-way and volunteers may stop you. c) It is recommended that skiers take off their skis and run up Morant’s Curve. d) About 3 km before Baker Creek, utility crews have plowed out some track, but track setters indicated skiers can keep their skis on. Leg 2: About 1.5 km east of Baker, skiers will cross the BVP well before Protection Mtn Campground. A new trail has been cut and track set on the south side of the BVP, parallel to the rail line. Leg 3: As skiers enter Johnston Canyon Campground, they will be directed by a volunteer to take off their skis and run 300m to the checkpoint. Construction and overflow parking prevent a track being set. Leg 4: The steeper descents on the Hillsdale Split are groomed but not set. Signs are posted. Skiers may elect to take off their skis and run down the side of the road. Trail Report: We think the sun and moon are aligning for a fun loppet…there isn’t as much snow as we’d like east of Castle, but so it goes. With the return of cooler temps, crews have been out moving snow and preparing the track. Today snow was moved under the TCH bridges in Lake Louise and the ramp was built at Morant’s Curve. Tracks will be reset over the next 3 days. With varying snow cover, particularly after Castle Junction, ‘rock’ skis and large basket poles are advised. The loppet trail will be flagged where necessary with small orange flags stuck in the snow. - Parks have plowed out a short portion of the trail near the Chateau parking lots, just before dropping onto the Tramline. There may not be a track but the Chateau track setters hope to have it skiable. - Without new snowfalls before Sunday morning, expect the usual at Morant’s Curve: a 600m jog on the edge of the BVP. - Some AltaLink utility work is packing down a small portion of trail about 3km before Baker Creek. Skiable. - After only 1.5km east of Baker, skiers will cross to the S side of the BVP, and may have to ski along the edge of the BVP (or run) for 150m. This is due to AltaLink’s ongoing work on the power line under which we have usually skied. A new trail will continue on the S side and join the usual trail set for the winter. 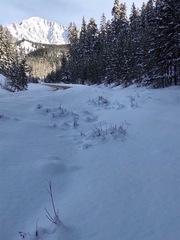 - Near the end of leg 3, and after crossing Johnston Creek and entering Johnston Canyon Campground, a volunteer will direct skiers to run on the (now) gravel road 300m to the checkpoint. Yep, maintenance work. - The steeper downhill portions of the Hillsdale Split will be groomed, not trackset. - The ski track approaching the finish line will be up on the snowbank. The vegetation and terrain dictate it. Check back for additional updates or changes to course. A final update will be posted on Saturday at 6pm. Additional commentary and photos can be found from our friend, skierbob.ca. Banff shuttle to LL: Space is still available on our shuttle departing Banff’s Central Park at 0700h, arriving at the Chateau by 0800h. Cost is $15 cash at the bus (small, unmarked bills preferred). If you didn't sign up for the shuttle during registration and would like to take advantage of this service, please email ac.teppol|ofni#ac.teppol|ofni. Similarly, if you need to cancel your shuttle booking, please advise by sending an email. These buses will also transport skiers, at no charge, between checkpoints and then rotate between the finish line at Sawback to both Central Park and the Banff Centre from about 1230h until 1530h. Following a great dump of snow on Thursday, trail packing and track setting have begun. And we even have a ParksCan permit! Crews were out today snowshoeing/“ski touring” the Hillsdale Split (leg 4) and initial sled passes of leg 3. Short sections of leg 2 east and west of Baker Creek are currently closed because of ongoing AltaLink power line work, but they will be available for us to track set after the 15th. At this time, perhaps the nicest portion is Castle Lookout westbound towards Protection Mountain Campground and return. See you on the trail! HNY all! This is a reminder that the deadline for partial refunds ($35) is tomorrow, Friday, Jan 4 by 8 pm. Please send a note to ac.teppol|oj#ac.teppol|oj that you are unable to attend (Sorry to hear that.) and we will pass your spot onto someone in the waiting pool. The Mountaineer Lodge in Lake Louise is offering a 15% discount for Fri/18 and/or Sat/19 nights, if you book directly with them. Just mention "LL to Banff Loppet". Thanks to all who registered last Saturday and will be joining us on Sunday, Jan 20. We have closed the waiting pool list with 25 skiers hoping for a loppet entry. We would appreciate hearing from any registered skiers who cannot ski the loppet, so that we can offer their spot to someone on the list. If you were unsuccessful at registering for the 2019 Loppet, a waiting pool has been created. Send the solo or team members' names, ages, and phone numbers to ac.teppol|ofni#ac.teppol|ofni; you will be contacted if spaces open up. A reminder that the 2019 registration opens this Saturday, December 1 at 0800h MST on Zone4.ca. Please have your demographic information at the ready, including (if appropriate) team member names, ages, and phone numbers. The 50km (4 legs) loppet will occur on Sunday, January 20, 2019. Our Environmental Assessment has been approved by Parks Canada. Start your training. Loppet on! After a one year hiatus, our loppet is returning to the valley! The Bow Valley Parkway reopened this summer following a major road rebuild at Morant’s Curve (leg 1). Pending Parks Canada’s approval of our Environmental Impact Assessment, the loppet will be held on Sunday, January 20 (snow/cold weather backup date of Sunday, January 27.) After lengthy discussions with Parks, we are no longer able to ski through the ‘backswamp’ (leg 5); thus the 2019 loppet will be on our previously used 50km course, ending at the Sawback picnic area. Four legs with 200 skiers (solo or teams of 2, 3 or 4. No solo and team members combined). Free bus shuttles will bring skiers from the Sawback finish line back to Banff's Central Park and to the Banff Centre. We plan to open online registration on Zone4 at 0800h (MST), Saturday, December 1. Now, many of us (organizers, participants and volunteers) have all felt the ‘loppet love’, but several committee members are feeling the need to take the hefty loppet retirement package. As a committee, we didn’t want 2017 to have been the unintended final loppet after so many great years. Perhaps 30 loppets?! That being said, the committee is looking for some of you nordic ski enthusiasts to pick up the cause for future loppets by joining the organizing committee and assuming some of our roles. Feel confident that the transition would be well supported by outgoing members. Plus, there’s the use of the corporate jet. In the meantime, start your taper.